Microsoft plans to release Windows 10 version 1809 at the beginning of October 2018 to the public. While it is probably a good idea to wait at least a month before installation of the update on production machines, downloading and installing the update early is great for test environments, virtual machines, and on systems where backups may restore the previous status quo if things should go wrong. Update: Microsoft released Windows 10 version 1809 officially. You can select Settings > Update & Security > Check for updates to download and install it if Microsoft deems the PC compatible with the update. Users who prefer an ISO can download it from Adguard instead or download the Media Creation Tool from Microsoft. Download the new product.cab zip archive from the Deskmodder website. Note: You can also download it from this GitHub page. 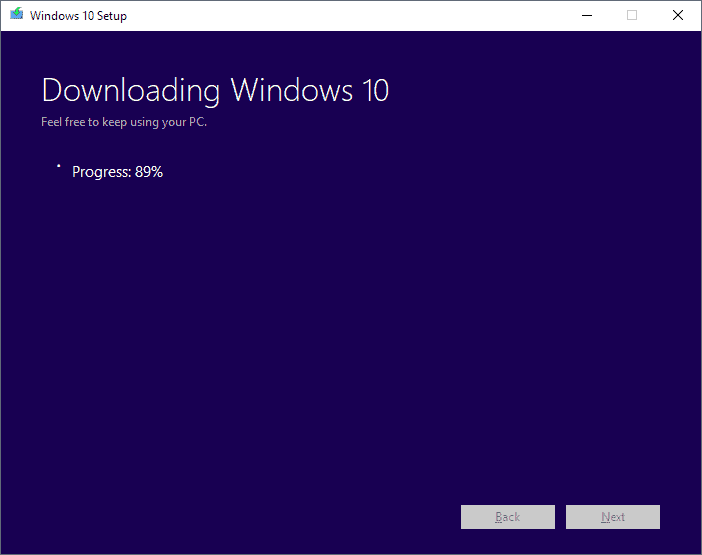 Instructions for downloading Windows 10 version 1809, the October 2018 Update, installation media right now from Microsoft. No thanks! Spring Update Ver. 1803 was a total disaster that created a slew of problems with my system. While the Browsers would load, web pages were blocked and wouldn’t load. Kept getting DNS errors (blocked) in spite of flushing the DNS. completely re install Windows with some updates, minus 1803. I will wait until 1809 is fully tested before attempting to update. Microsoft has some serious QC issues, for sure. Reinstall? In 2018? :D Come’on, use backupper! If you thought 1803 was a complete dumpster fire than I would like to know what you think of 1809. They still haven’t fixed the task view bugs nor the on screen keyboard bugs. Both are incredibly slow since their pure XAML and UWP rewrites. They fixed a couple of bugs that should have been fixed with a cumulative update. There are still so many bugs that MS won’t fix until the next release even though they SHOULD be fixing it with a cumulative update. not a normal issue. so I would blame you, “steve”. Seriously? that wasn’t even a proper comment — we should be talking about 1809 and not your old problems with 1803 and how you’re reverting to 1709 or whatever your dumbass is doing. You need a smart tech savvy friend and to shut up. I’ve have 2 main computers and a side “insider” computer now going onto Windows 10 Insider Preview 18267.1001 so you should abandon computers and just get an android tablet or maybe even an ipad (things that are not computers but consumer devices). won’t it be easier to just go the insider route? Actually, no it’s not. Also, you’d be left with a “this setting controlled by insider blah blah blah”, in spots.The instructions are perfect. 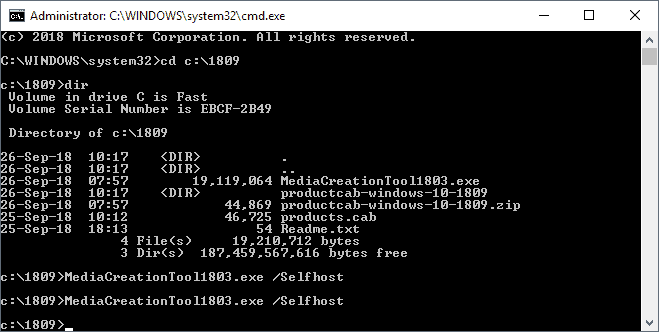 I already installed 1809 on two machines using a USB stick made with the MediaCreationTool1803 using the directions provided. but for the purpose of testing stuff in vm and all, does that even matter? there’s also no guarantee this will be the “final” version. https://s1.rg-adguard.net/dl/decrypt/decrypt-multi-release_v180925.7z to decrypt and convert esd file to iso. Been running 1809 for 48 hrs now, and it works great. Go ahead and force the upgrade, just don’t come whining when something goes wrong. I’ll just wait for it to show up on my WU, as then I’ll know the Upgrade is fully compatible with my System due to telemetry. To wait a month until deployment is very underestimated calculation. Even Windows 10 1803 haven’t been production ready and now the next version is coming to ruin users systems. All well and good; however, with the multitudinous complaints about new releases who would even want a new release that requires modification of the Media Creation Tool via adding files to a folder. The mass of Windows 10 users lead lives of absolute desperation. Maybe get going on the promised Linux series, so users can find something productive to do with their short lived lives–other than try new versions of Windows that won’t be ready for months. Good luck if you try; maybe MS has suddenly provided a problem free upgrade. You may have to go download it at the Microsoft Update Catalogue if you pc doesn’t automatically upload it. MyDigitalLife site has far easier methods to download the 1809 pending release, in several formats. same.. how can fix that ? If you look in the xml in the products.cab everything is set for a China-based PC installation. This is why some people are getting an error when trying to update saying it won’t work for your PC’s region. Windows 10 was, is, and will always be in a perpetual beta state. Download and install a Green Banana version, what could possibly go wrong? Thanks, I removed the link for now. 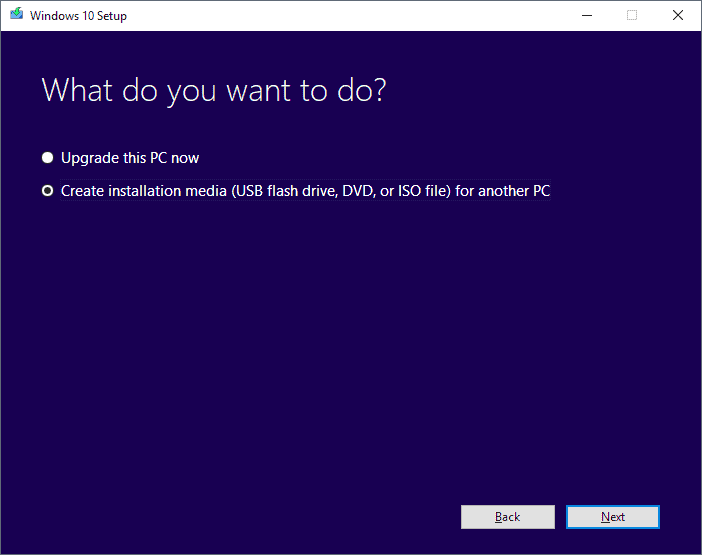 I look forward to installing 1809 over 1803 – maybe tomorrow via WU??? This link has reasons to do so, and some of the information was new to me. For me I had to read the link using latest Chrome beta zoomed at exactly 200%. Your mileage may vary. I installed Windows 10 Home x64 Version 1809 (OS Build 1763.1) with no unanticipated problems. From initial download using WU to final restart complete took 69 minutes for me. System Explorer icon showed there was then significant CPU activity, so I did nothing for 77 minutes to let CPU activity return to normal. Now to explore its features….